Portrait by Charles Beaubrun, ca. 1660s. Maria Theresa of Spain (Spanish: María Teresa; French: Marie-Thérèse; 10 September 1638 – 30 July 1683), was by birth Infanta of Spain and Portugal (until 1640) and Archduchess of Austria as member of the Spanish branch of the House of Habsburg and by marriage Queen of France and Navarre. 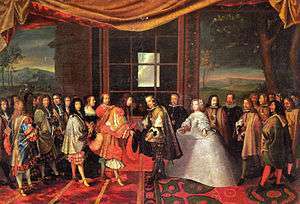 Her marriage in 1660 with King Louis XIV was made with the purpose to end the long-standing war between France and Spain. Famed for her virtue and piety, she saw five of her six children die in early childhood, and also is frequently viewed as an object of pity in historical accounts of her husband's reign, since she had no choice but to tolerate his many illicit love affairs. Without any political influence in the French court or government (except briefly in 1672, when she named Regent during her husband's absence during the Franco-Dutch War), she died at the early age of 44 as a result from a abscess on her arm. Her grandson Philip, Duke of Anjou, inherited the Spanish throne in 1700 after the death of King Charles II (Maria Theresa's younger half-brother), founding the Spanish branch of the House of Bourbon, who reigned with interruptions until today. 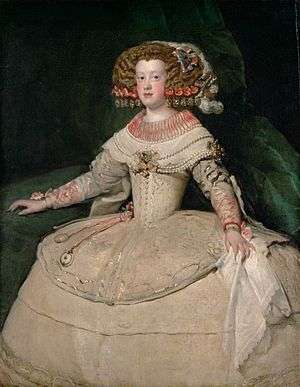 Born an Infanta of Spain at the Royal Monastery of El Escorial, she was the daughter of King Philip IV, and his wife Elisabeth of France, who died when Maria Theresa was six years old. As a member of the House of Habsburg, Maria Theresa was entitled to use the title Archduchess of Austria. Unlike France, the kingdom of Spain had no Salic Law, so it was possible for a female to assume the throne. When Maria Theresa's brother Balthasar Charles, Prince of Asturias, died in 1646, she became heiress presumptive to the vast Spanish Empire and remained such until the birth of Philip Prospero, Prince of Asturias, in 1657. She was heiress presumptive once more between 1 November and 6 November 1661 - the death of Prince Philip and the birth of Prince Charles, who would later inherit the thrones of Spain as Charles II. In 1658, as war with France began to wind down, a union between the royal families of Spain and France was proposed as a means to secure peace. Maria Theresa and the French king were double first cousins: Louis XIV's father was Louis XIII of France, who was the brother of Maria Theresa's mother, while her father was brother to Anne of Austria, Louis XIV's mother. Anne of Austria desired an end to hostilities between her native country of Spain and her adopted one, France. However, Spanish procrastination led to a scheme in which France's prime minister, Cardinal Mazarin, pretended to seek a marriage for his master with Margaret Yolande of Savoy. When Philip IV of Spain heard of a meeting at Lyon between the Houses of France and Savoy in November 1658, he reputedly exclaimed of the Franco-Savoyard union that "it cannot be, and will not be". Philip then sent a special envoy to the French court to open negotiations for peace and a royal marriage. The negotiations for the marriage contract were intense. Eager to prevent a union of the two countries or crowns, especially one in which Spain would be subservient to France, the diplomats sought to include a renunciation clause that would deprive Maria Theresa and her children of any rights to the Spanish succession. This was eventually done but, by the skill of Mazarin and his French diplomats, the renunciation and its validity were made conditional upon the payment of a large dowry. As it turned out, Spain, impoverished and bankrupt after decades of war, was unable to pay such a dowry, and France never received the agreed sum of 500,000 écus. A marriage by proxy to the French king was held in Fuenterrabia. Her father and the entire Spanish court accompanied the bride to the Isle of Pheasants on the border in the Bidassoa river, where Louis and his court met her in the meeting on the Isle of Pheasants on 7 June 1660, and she entered France. On 9 June the marriage took place in Saint-Jean-de-Luz at the recently rebuilt church of Saint Jean the Baptist. After the wedding, Louis wanted to consummate the marriage as quickly as possible. The new queen's mother-in-law (and aunt) arranged a private consummation instead of the public one that was the custom. On 26 August 1660, the newlyweds made the traditional Joyous Entry into Paris. Louis was faithful to his wife for the first year of their marriage, commanding the Grand Maréchal du Logis that "the Queen and himself were never to be set apart, no matter how small the house in which they might be lodging". Maria Theresa was very fortunate to have found a friend at court in her mother-in-law, unlike many princesses in foreign lands. She continued to spend much of her free time playing cards and gambling, as she had no interest in politics or literature. Consequently, she was viewed as not fully playing the part of queen designated to her by her marriage. But more importantly, she became pregnant in early 1661, and a long-awaited son was born on 1 November 1661. The first time Maria Theresa ever saw the Palace of Versailles was on 25 October 1660. At that time, it was just a small royal residence that had been Louis XIII's hunting lodge not far from Paris. Later, the first building campaign (1664–1668) commenced with the Plaisirs de l’Île enchantée of 1664, a week-long celebration at Versailles ostensibly held in honour of France's two queens, Louis XIV's mother and wife, but exposed Louise de La Vallière's role as the king's maîtresse-en-titre. The celebration of the Plaisirs de l’Île enchantée is often regarded as a prelude to the War of Devolution, which Louis waged against Spain. The first building campaign witnessed alterations in the château and gardens in order to accommodate the 600 guests invited to the celebration. As time passed, Maria Theresa also came to tolerate her husband's prolonged infidelity with Françoise-Athénaïs, Marquise de Montespan. The king left her to her own devices, yet reprimanded Madame de Montespan when her behaviour at court too flagrantly disrespected the queen's position. Later, the governess of Montespan's illegitimate children by the king, Madame de Maintenon, came to supplant her mistress in the king's affections. At first she resisted the king's advances and encouraged him to bestow more attention on his long-neglected wife, a thoughtfulness which Maria Theresa repaid with warmth toward the new favourite. After the queen's death, Maintenon would become the king's second, although officially secret, wife. Maria Theresa played little part in political affairs except for the years 1667, 1672, and 1678, during which she acted as regent while her husband was away on campaigns on the frontier. Marie-Thérèse's burial site at the Basilica of St Denis, where most of France's monarchs are buried. During the last week of July 1683, Maria Theresa fell ill and, as her illness worsened, her husband ordered for the sacraments to be kept nearby. She died a painful death on 30 July 1683, at Versailles. Upon her death, Louis XIV said: "This is the first trouble which she has given me." 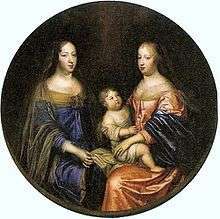 Of her six children, only one survived her, Louis, le Grand Dauphin, the oldest one, who died in 1711. One of her younger grandsons would eventually inherit her claim to the Spanish throne to become King Philip V of Spain in 1700. Louis, Grand Dauphin 1 November 1661 14 April 1711 Dauphin of France from 1661–1711. Father of Louis, Dauphin of France (1682–1712), Philip V of Spain and Charles, Duke of Berry (1686–1714). Marie-Thérèse of France 2 January 1667 1 March 1672 Known as Madame Royale and la Petite Madame. Maria Theresa was portrayed by British actress Elisa Lasowski in the 2015 TV series Versailles. ↑ Marie-Thérèse d’Autriche in: www.chateauversailles.fr [retrieved 23 November 2016]. ↑ Antonia Fraser. Love and Louis XIV. ↑ Ian Dunlop. Louis XIV. London: Pimlico, 2001. Wikimedia Commons has media related to Marie Thérèse of Austria.